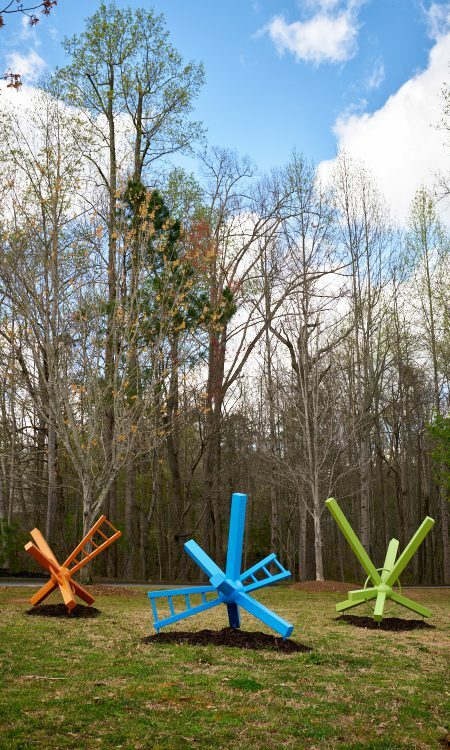 The works of art featured in this year's sculpture tour can be described as whimsical, witty, nostalgic, awe-inspiring. 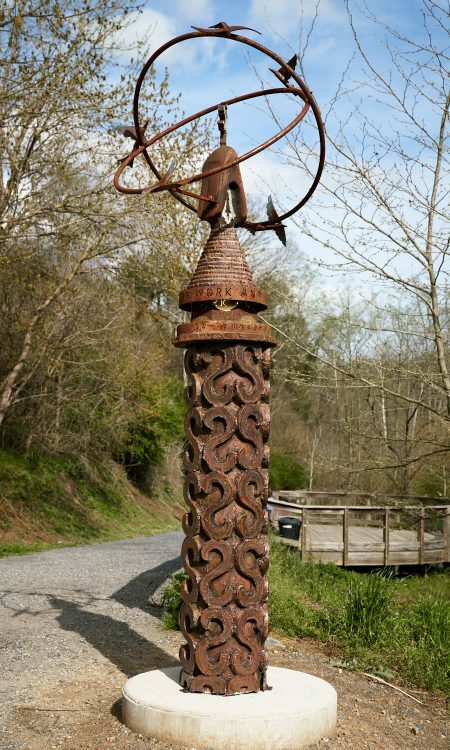 Cutting and welding metal is a spiritual exercise for the artist, who purchased the bulldozer tooth at an Atlanta scrap yard, surmounted it with a figure of a running female torch-bearing Olympic athlete and created a pyramid to hold it up. Inspired while walking in the high plains desert near the Dragoon Mountains as well as Job 12:8-10, the artist’s work represents the fusion of nature and creation, with the hand representing human kind’s dominion, yet still cherishing creation. The fish’s skin of holographic film diffracts light both day and night, shimmering and changing colors depending on the viewer’s position. @ Don White Volleyball; stainless steel powder finished coated; 63” x 56" x 32"
The name Votive is derived from the word “devotional.” A soft visual space is created to draw you into a contemplative moment. Curves and circles - spiritual shapes alluding to the circle of life and no beginnings or endings - are used to evoke feelings. The artist uses cutting-edge technology like hydro-cutting, 3-D printing, and CAD modeling, combined with traditional methods of sculpture making, creating this work from aluminum diamond plate, often seen in truck boxes and other industrial materials using an advanced algorithm, which chopped up a 3D model into a low polygon structure of interlocking triangle. @ Roswell Cultural Arts Center bridge; blue pearl granite; 60” x 20” x 8” | As a sculpture professor at Hong Kong Baptist University, Rothermel helped develop the Academy of Visual Arts and traveled throughout China to find raw materials, which is where these materials were discovered. He was inspired by the materials’ history, symmetry and beauty. This piece explores the visual effects of color inspired by contradictions in human nature. One side of the piece is bright red, while the other side is a myriad of colors and shades. The style of sculpture is linked to Expressionism and Optical Art. Inspired by color, nature and geometry the artist creates dynamic interactions with viewers. 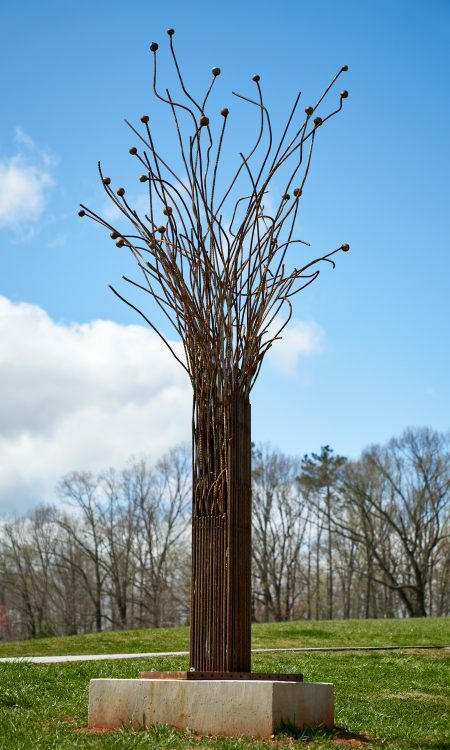 @Leita Thompson, Arts Center West; steel plate, rebar (from a highway construction site), steel shot; 15’ x 8’ on 32” x 32” x 2.5” base | As a child, Hetherington took long walks from the dairy barn to the cow pasture and into the forest finding the horses. Curiosity inspired him to follow and watch them graze from the “Horse Apple” trees. The artist triggers this same curiosity in viewers who wonder about the stories behind the materials used in his sculptures. In designing and producing large scale public sculptures, Pierce’s work has developed a harmonious relationship with the public landscape. The sculpture stimulates conversation and challenges our perceptions of the changing landscape as relating to our modern technology and how we communicate. Made up of over 500 pounds of automobile transmission parts welded together to form a giant fish that stands elegantly on three fins, the carefully selected assemblage of transmission gears form the fish’s eyes; and the circular spots on the side of the fish are made from an eclectic combination of gears, pulleys, rings, and car parts. The tail fin is swept to one side as to capture the fish in a swimming motion.